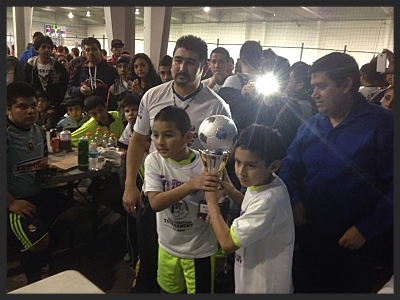 SOCCER NATION WINS "BEST SMALL BUSINESS OF THE YEAR"
Soccer Nation KC y YMCA de Kansas City trabajaran juntos. Soccer Nation is the newest soccer indoor facility (40,000 square ft.) in the Kansas City area, and the only one located in Kansas City, Kansas. Our mission is to provide safe, quality, year-round recreational and competitive soccer leagues for the youth and adults in the Kansas City and surrounding areas promoting the values of fellowship, sportsmanship, honesty and respect for authority. Soccer Nation has two professional-style lighted turf fields, for fast-action and fun soccer. No matter what the weather conditions are, day or night, soccer players will find a safe, clean, and friendly atmosphere for soccer enjoyment. Several divisions for youth, men, women, and coed provide all players--from beginners to highly skilled--the right environment for recreational yet competitive soccer. League play is continuous year round. Rain or shine, Soccer Nation host leagues, practices, tournaments, & more on our indoor turf fields having games everyday of the week. "THE BEST PLACE TO HAVE FUN"